Do spirits and demons really exist? According to Japanese mythology they do. Not only that, they are constantly around us but we just can’t see them. What if one day you suddenly could not only see them but interact with them? What if one day you found yourself in massive debt and had to work for an exorcist to send them to the underworld? One day, that happens for Ashiya. He finds himself possessed by a yokai and ends up going to see the school’s so-called exorcist, a fellow student by the name of Abeno, in his own class no less! Once his yokai has been exorcised he finds himself in a massive debt to his would-be savior and must work for him to pay it off. This is not a story about ghosts and ghouls. This is a story about pleasant yokai that need to be sent to the Underworld. The problem is, they can’t make the journey on their own. The need the Master of the Mononokean to open a portal for them so that they can travel there. While there are a few “scary” (as in little kid scary) moments, the show itself is a fun collection of stories from the Manga (which I also recommend, it’s quite good too). 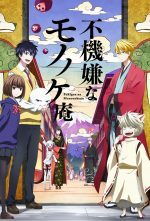 Primarily the story plot revolves around Ashiya as he learns to cope with yokai and his new job. Secondary plots revolve around the various yokai they interact with. The Mononokean itself is a yokai that allows the Master to travel quickly from one part of the Overworld to another, or between the Overworld and the Underworld. Not much is told about the backstory of the Mononokean itself, though a few hints are made. The Manga doesn’t provide many more details either, but I have hopes that as the Manga progresses it will reveal more information. The Anime itself was not spectacular, but it was a good clean show. I really enjoyed it, though that may be in part due to how much I have enjoyed reading the Manga (also available on Crunchyroll). It is an average single season length, but there is potential for more episodes as the Manga has continued a good ways past the end of the Anime. Summary: Fairly simple but clean show about a high-school boy who helps to exorcise (friendly) yokai.